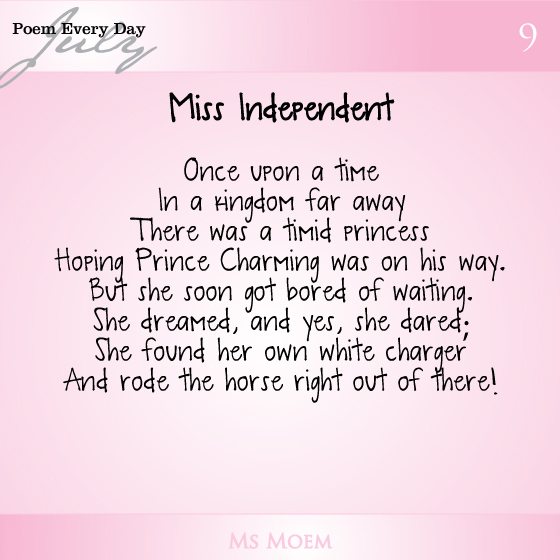 Miss Independent | A Fairytale | #dailypoemproject | Ms Moem | Poems. Life. Etc. Hoping Prince Charming was on his way. But she soon got bored of waiting. And rode the horse right out of there! Miss Independent is a poem written by Ms Moem. This is poem 9 of my daily poem project. The prompt was ‘A story’. This is also post 79 of the 100 blogs in 100 days challenge!